Virginia football offensive guard Ben Knutson has announced his decision to transfer, becoming the second scholarship offensive lineman to do so this offseason. Knutson, who is in his third year at UVA, plans to graduate this spring will have two seasons of eligibility remaining wherever he lands next. Knutson, a 6’9”, 310-pound guard, signed with the Cavaliers out of Penn High School (Mishawaka, IN) in February of 2016. He didn’t see any game action as a true freshman, but he did play in 10 of 13 games in his second year, earning two starts along the way. Knutson’s production took a step backwards in 2018, though, as he saw playing time in nine games and played primarily on special teams. 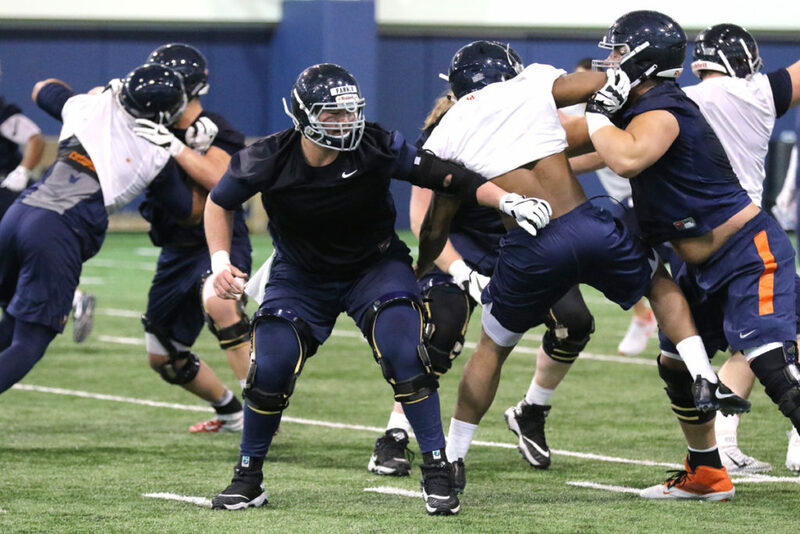 Knutson and R.J. Proctor, a redshirt junior who will leave Charlottesville with a bachelor’s degree in hand, are the two offseason offensive line transfers. These departures leaves Virginia with 15 scholarship offensive linemen, including no seniors, on the 2019 projected roster. Dillon Reinkensmeyer (OL): After redshirting in 2016, Reinkensmeyer has been a mainstay on the Cavalier offensive line the past two seasons, starting 24 games combined in 2017 and 2018. Center has been the Colorado native’s primary position; however, he has also played tackle and guard. Chris Glaser (OG, OT): Glaser emerged toward the latter part of his true freshman season in 2017. He wound up playing in five games, earning two starts, at right tackle that year. Glaser primarily played guard this past season as a sophomore, playing in all 13 games and earning seven starts at left guard. Tyler Fannin (C): After sitting out his true freshman season in 2017, Fannin impressed in the months leading up to 2018 before suffering a leg injury in preseason practice. He would miss the entire season, so he could be a candidate for a sixth-year depending on how his career unfolds. The buzz surrounding his play pre-injury is a positive, so I’m looking for him to emerge in 2019. Bobby Haskins (OT): The 6’7”, 280-pound Haskins showed well as a true freshman in 2018, playing in all 13 games. He saw time at both tackle spots over the course of the season. Ryan Nelson (OT): After sitting out his entire true freshman year, Nelson emerged as the starting left tackle in 2018. The California native started all 13 games for the Hoos, primarily playing tackle but also seeing some time at guard. A promising start to the 6’4”, 310-pound Nelson’s Cavalier career. Ryan Swoboda (OT): The 6’10”, 290-pound Swoboda didn’t play as a true freshman in 2017. He appeared in all 13 games in 2018, though, playing offensive tackle, tight end and on special teams. He didn’t see a ton of time on the offensive line, but he did gain some experience. Swoboda started at tight end against Ohio. Gerrik Vollmer (C/OG): Vollmer saw the first action of his college career in Virginia’s win over Liberty, when he played a few snaps at center. Virginia loses three starters from this past season’s offensive line, including full-time starters Jake Fieler (guard/center) and Marcus Applefield (grad-transfer who started all 13 games at right tackle) as well as part-time starter Proctor (guard). The unit had its ups and downs but seemed to improve overall from the previous year. Its performance against South Carolina was most notable, as the line set the tone early against the Gamecocks and ultimately paved the way for running back Jordan Ellis to rush for 106 yards and a touchdown. Looking ahead to 2019, Virginia will feature a talented but mostly inexperienced group. Of the 15 scholarship offensive linemen projected on next season’s roster, nine have not yet played a down on the major college level. This includes Fannin, who as mentioned above has shown promise in practice, as well as four rising redshirt freshmen who will have had a full year in the UVA weightlifting program heading into the 2019 campaign. Barring injury, Reinkensmeyer, Glaser and Nelson should headline next year’s starting offensive line unit. Reinkensmeyer and Nelson boast double-digit starts, while Glaser has nine starts in 18 contests. How the rest of the starting line will fill out remains to be seen, although Haskins and Fannin appear to be good candidates at this point. Certainly, though, there is plenty of opportunity for any of other players to emerge as either starters or rotational players, including from a first-year class that boasts 4-star Ja’Quay Hubbard. Outside of the scholarship players, rising redshirt sophomore Victor Oluwatimi is a walk-on to keep an eye on heading into next season. He’s not your typical walk-on. The former DeMatha Catholic (Hyattsville, MD) standout – a two-time all-WCAC performer – transferred to UVA from Air Force last offseason. Even though he didn’t play as a true freshman at Air Force in 2017, Oluwatimi had to sit out all of 2018 due to NCAA transfer rules. The 6’3”, 295-pound lineman have three years of eligibility left beginning next season. The offensive line has been a major focus of Coach Mendenhall’s since he was hired in December of 2015. Fourteen offensive line prospects have signed with UVA during Mendenhall’s first three full recruiting classes, including five in 2017, five in 2018, and four (so far) in 2019. During his Early Signing Period press conference last month, the Cavalier head coach seemed pleased with the numbers. The departures of Proctor and Knutson may mean more emphasis on finding a graduate transfer offensive lineman for next season. Then again, if Mendenhall is comfortable with the young talent coming up, he may not. I’m leaning toward the former just because of the lack of proven players heading into next season. We do know Mendenhall and company are open to adding another class of 2019 prospect on the line. The Cavaliers offered South Point (N.C.) offensive lineman Larry Dowdy this past week. Dowdy, a 6’3”, 280-pound senior and two-time all-state selection, has decommitted from Georgia Tech after not hearing from new Yellow Jackets head coach Geoff Collins and staff. He reportedly is now choosing between Appalachian State, Louisville, North Carolina and UVA. Even if the Hoos sign a fifth offensive lineman in the 2019 Class, the graduate transfer route still seems a logical one this offseason. Looking ahead to 2020, look for Virginia to continue to address the line, although depending on how the current players progress the need may finally not be quite as big. Virginia taking three offensive line recruits in 2020 seems like a safe bet.